If you've hung out with me a couple of times by now, you'd know that I love culottes. Culottes are below knee-length women trousers that are wide legged to resemble a full skirt. They're comfy, stylish, and perfect for any season. Trust me... I've worn woolen culottes in the winter as well, with some tights underneath and they looked just as good as they do in the spring! Here are two looks I've styled with these slitted culottes that can take you from a day to evening look, in just minutes. Culottes can get a bit tricky to style and work with, but it's all about finding the right length and silhouette for yourself. This time I chose a longer length culotte, so let's get started! I went a bit casual with the day look here. 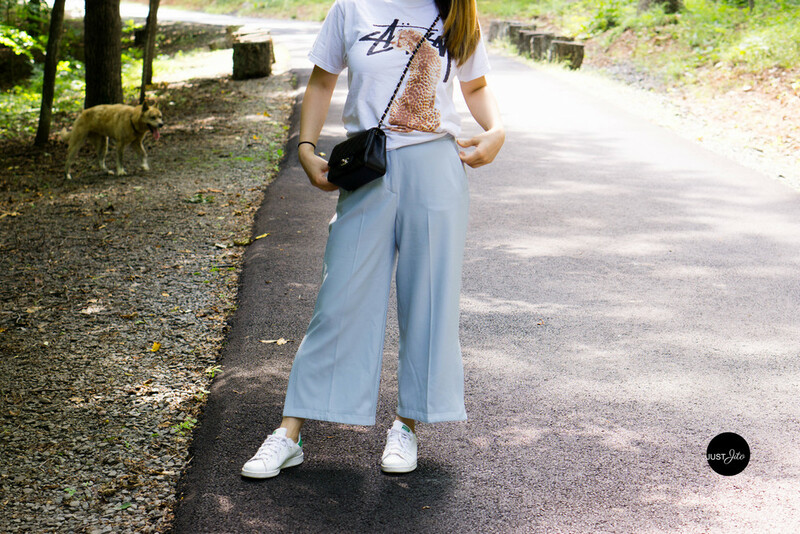 I've paired a Stussy graphic tee with my culottes and some Stan Smiths. If you're looking to recreate a look similar to this, you can essentially use any white graphic tee you have and some white sneaks to give this a bit of that street style. For the evening look, I paired the culottes with an off-white plain satin shirt and some army green wedge heels. I kept the same Chanel bag but the beauty of this bag is that I can wrap the chain 2-3 times around the front flap and it turns into a clutch! To pull the evening look together, the heels offer a pop of color to this rather muted look and elevate the look so that you're ready for a night out! If you haven't gotten yourself to get a pair of culottes... this is the season to do so! I know it might not work for everyone but why not give it a try? Below, are the outfit details of today's post. Hope you enjoyed it and see you back here again!